Dr Autar Mattoo is Research Leader of the Vegetable Laboratory at the USDA’s Henry A. Wallace Research Center, USA is internationally-renowned for his research on tomato physiology. Dr Avtar Handa as Professor of Horticulture at Purdue University, USA is internationally-renowned for his research on tomato physiology. Tomatoes are the second most important vegetable crop in the world after potatoes. Originating in South America, they are now grown widely around the world. As the population continues to grow, there is a need to increase yields in the face of such challenges as climate change, threats from pests and diseases and the need to make cultivation more resource-efficient and sustainable. 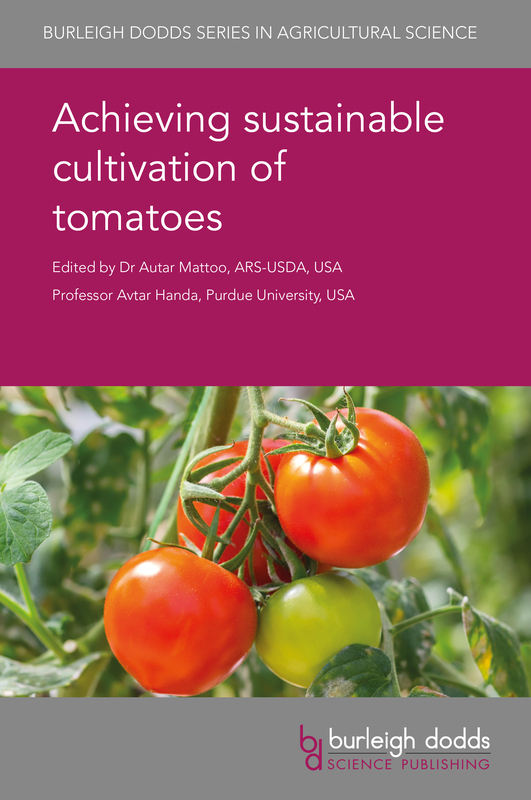 Drawing on an international range of expertise, this collection focuses on ways of improving the cultivation of tomatoes at each step in the value chain, from breeding to post-harvest storage. The book begins by looking at improvements in cultivation techniques, before moving on to review advances in ensuring genetic diversity, understanding of tomato physiology and breeding techniques. The collection concludes by discussing developments in understanding and managing pests and diseases. Achieving sustainable cultivation of tomatoes will be a standard reference for horticultural scientists in universities, government and other research centres and companies involved in tomato cultivation. "The editors, contents and authors suggest this will be a valuable reference for tomato scientists." " …provides a very effective background to genetic tools to control viral and other diseases, thus complementing the earlier parts of the book which draw attention to the strategic importance of exploiting genetic diversity to develop crops with greater resistance to biotic and abiotic stresses…The book will certainly benefit plant breeders and those involved with genetic engineering technology to develop new crop varieties."